Siem Reap: Epicurean Explorations – ruru's ruminations. Food is the language we all speak. Food is also the door to another culture; the physical manifestation of complex undertones of emotion, complicated webs of history, and ineffable human connections and individual refinements that all coalesce in a beautiful explosion of flavors. One mouthful is all it takes to taste the rich Cambodian history, with many mouthfuls to come. Cambodia was once a French colony: perhaps that explains the perfectly baked baguettes that lie stacked on top of each other in streetside carts; the strangely crêpe-like banana chocolate ‘pancakes’ flaunted by men in oversized t-shirts and overflowing aprons; and the smorgasbord of eateries that seem to stretch in a never ending line of temptation. The food here is supreme. And inexpensive too; from US$3 a meal for those local Khmer steals, to US$15 a nosh for those swanky semi-fine dining Italian schnazz. Not bad, not bad at all. Even the hotel food was superb (we stayed in Petit Villas Boutique & Spa). Even though it was a tad on the pricey side for Cambodia, by Singapore standards it was a steal. Not to mention the numerous free mint slushies, lemon teas, and mango yogurt smoothies the chef lavished on us after we returned to the hotel each day (and complimentary three-course breakfast each morning!). Fresh fruits- Healthy start to a long day. Fresh spring rolls – crisp, clear, inviting. Just one of the many complimentary drinks from the chef; fresh mango fruit shake. By far my favorite breakfast option of the day: Beef noodle soup – dense, yummy, and worth every single lip-smacking gram of sodium chloride! Tastiest omelette I’ve ever had! I’m the queen of mango smoothies. There are three things that you cannot leave Cambodia without trying – Beef Lok Lak, Amok fish curry, and some variation of Khmer noodle soup. Different restaurants and street-side eateries have their own little spin on the renowned dishes (and watch out for those that serve it with packet instant noodles and ketchup), but what is on offer is simply delectable. That is, if you can conveniently ignore the fact that there are about a million rats scurrying about the place. But no worries, when in Cambodia, a little disregard and nonchalance with regards to sanitary considerations is called for. Tasty beef noodle soup somewhere opposite Ta Prohm. Fried rice Lok Lak – the best! The most amazing potato-rosti like dish on the way back from the floating villages. Always use a straw when drinking from a can in Cambodia. Bread Omelette – must try whilst watching the sunrise in Angkor Wat! Ice lemon tea in Angkor Wat. There were a few restaurants whose name I managed to catch hold of; but the inexpensive hidden gems were inevitably Cambodian with complicated Khmer names that I couldn’t make out if my life depended on it. A pretty dependable place for Khmer cuisine was Khmer Kitchen. Although undeniably touristy and certainly not value-for-money (not after the filling $2 dishes we scavenged in the obscure outskirts of town! ), they serve relatively inexpensive and decently sumptuous food. A few food stalls opposite Khmer kitchen served some pretty mean frog legs too, if you’re willing to give that a try. There was this one stall I kept returning to for their $0.5 freshly squeezed ice lemon juice, a delightfuly tangy and saccharine (quite literally drowning in granules of sugar) concoction. Another place behind Khmer kitchen had some sort of multi-meat course going on; kangaroo, crocodile, frog meat… If you’re up for something exciting, that’s definitely worth a try (we didn’t get the chance to try it out; a week in Siem Reap is hardly enough to get your fill of the cheap, good food). The most sumptuous pumpkin concoction. Lok Lak (again) with a delightful egg. Other tourist traps include The Red Piano and Le Tigre Papier. The Red Piano actually serves pretty good food; and the decoration is absolutely divine – mismatched retro pieces make for an oddly modern blend. Le Tigre Papier, on the other hand, may be known for its great cooking classes – but avoid this place at all costs for lunch. Terrible service, average food – and although inexpensive, overpriced for Siem Reap. Typical burger- nothing quite stellar. Cheesy galore at the Red Piano. Now, if you’re a little tired of the local fare and craving something familiar – head down to Sister Srey, an unprentious little café along the calming waters of Siem Reap river. It’s a petite start up with a humongous cause. Started by two Australian sisters with wonderful hearts and a beautiful story, the café trains and supports young Khmer students in equipping themselves with skills for the future. It’s a lovely restaurant with a jazzy sunday-afternoon-brunch ambience; a small winding staircase up and you’ll see that it’s also a store selling the most adorable knick-knacks and a bookstore-slash-shelf. I love its book policy – you can take it, borrow it, swap it for your own – all in the great spirit of sharing your favorite reads. It’s food is stellar too; I had the most delicious, lip-smacking chicken mango burger there. Succulent, juicy, and tender meat – perfectly balanced with unbelievably sweet mangos. Also, have a coffee. Or two. Or three. They serve a mean cup of joe. I had an iced coffee, which was perfectly good (I’m hardly a coffee connoisseur, but Lex had a proper cappuccino which looked pretty amazing). Chicken mango burger – look at the delightful onions peeking their brown edges out. Now last but definitely not least, snake. That’s right, a local delicacy not to be missed. To be quite honest, I’m not a fan. Snake tastes rather like dried chicken, albeit with the dry, repulsive texture of cardboard. 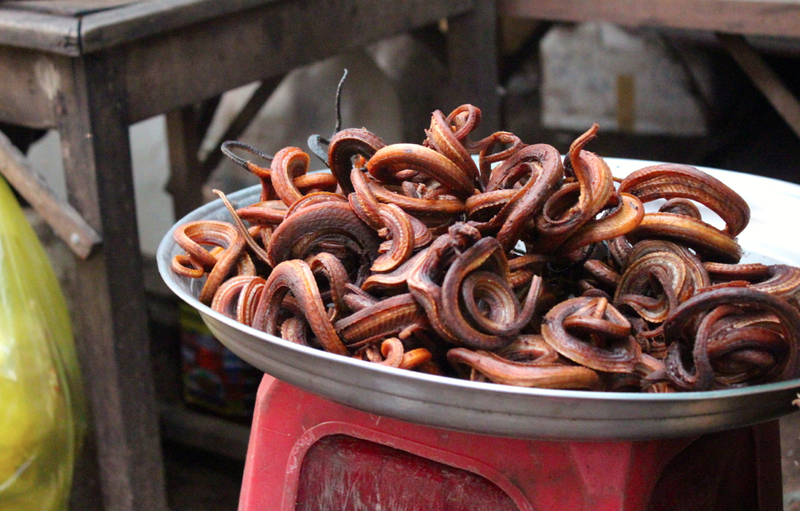 Perhaps it was just the streetside stall we were at (the driver muttered afterwards that he would never eat the snake offered there – yes, I know, then why would he bring us there in the first place?!). But still a pretty frightening sight, and a feat to pride oneself in. Crisp tails that intertwine in a strangely alluring clump of reptile goodness. Too bad it’s not the season, or else we would’ve tried fried tarantula.